McLeod Ganj was our next destination; it is one of the main tourist points from Himachal Pradesh state. McLeod Ganj is the residence of the XIV Dalai Lama, and thereafter an important centre of Buddhist studies and Tibetan culture, where are offered courses of meditation and Buddhist philosophy mainly but also massages, painting and even cooking courses. In Gangchen Kyishong, the neighbouring town to McLeod the headquarters of the Tibetan government in exile is, and also the Tibetan Medical and Astrological Institute, which was founded by the Dalai Lama in 1961. During our stay we visited the Tsuglagkhang complex which is formed by the Dalai Lama official residence, the Namgyal monastery, the Tibetan Museum and the Tsuglagkhang temple. According to people who explained to us, the Dalai Lama are the manifestation of Avalokitesvara, the Buddha of the Compassion who chose to reborn to serve the humanity. Tenzin Giatso, the current Dalai Lama, is the spiritual boss of all Tibetan Buddhism or Lamaism followers, and therefore the patron saint from Tibet too. 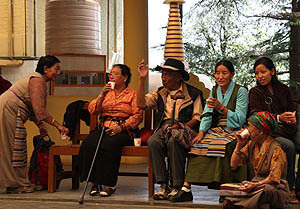 However, many Lamaist countries as Bhutan and Mongolia also have local leaders (elected in a similar way to the Dalai Lama and considered the incarnation of deities) who represent part of the administrative structure from the whole Tibetan Buddhism at world level. 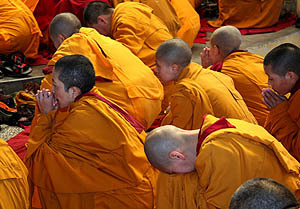 When each Dalai Lama dies, the monks (lamas) from the Yellow Monastery designate to the next reincarnation on a boy of short age, interpreting a series of signs according to their religion. In the period between a Lama’s death and the eighteen of the following one, the Monastery exercises the power designating a tutor, who is in charge of the education of the future boss. In the Tsuglagkhang complex we visited the monastery Namgyal, the personal monastery of the Dalai Lama which has the function of maintaining ritual practices and teachings of all the four main lineages of Tibetan Buddhism. According they explained to us the monastery is specially privileged and honoured to perform annually the sacred rites and rituals established by the successive Dalai Lama for the temporal and spiritual benefits and prosperity of Tibet and its people, and for world peace in general. 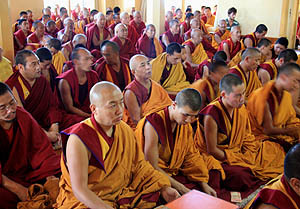 At present the monastery has nearly 200 monks and younger monks who are engaged in study the main texts of Sutras (teachings given by Buddha or some of his closer disciples) and Buddhist Tantra (esoteric traditions which teach to use the desire transforming it as path toward the realization). 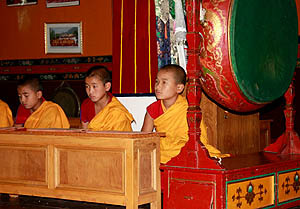 The monks also pursue the modern studies of both languages, Tibetan and English. Then we went to the temple Tsuglagkhang which was plenty of monks. It is for the Tibetans exiled the equivalent one to the temple of Jokhang, the most famous of the Buddhist temples in Lhasa. It has a golden statue of 3 meters of Buddha, and to its sides are images of Avalokistesvara and of Padmashambava also known as Guru Rinpoche, the Indian wise teacher of the century VIII AD. 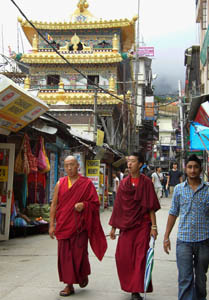 who introduced the Tantric Buddhism in Tibet and who according to the nyingmapa school is considered the second Buddha. 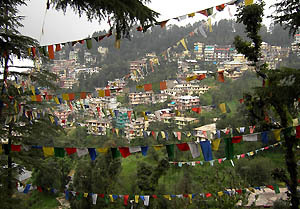 The temple, as the whole city, has an infinity of prayer flags which are mantras written that are spread as blessing for the whole community with the blow and that through their waste they remember that the life is perishable and that everything ends up, to reborn once more, transmute and to evolve again, thereby according to the tradition on the beginning of the Tibetan year usually the flags are changed for others. During the last days of our stay in McLeod Ganj we also visited the Tsechokling Gompa, which was built in 1987 in substitution of the original Dip Tse Chokling Gompa of Tibet, destroyed during the Cultural Revolution. There, a small community of monks of the order Gelukpa exists. We attended to the morning prayer which consists on singing passages of the Holy Scripture accompanied by the sound of cymbals, drums and Tibetan horns. We also visited the Tibet museum which counts the tragic history of the China occupation and of the consequent exodus of Tibetan people, through pictures, interviews and videos. It was in the year 1949 that Tibet, an autonomous Kingdom governed by the religious dynasty of the Dalai Lama, was invaded by the Chinese army to “Liberate to the Tibetan people”. Since for it is calculated that the Chinese occupation of Tibet has cost 1,2 million lives and it has forced to the exile to 200.000 people. Also more than 6.000 monasteries, temples and other cultural and historical constructions have been destroyed and plundered, what means the 90% of its immense cultural patrimony. The museum also counts how in March 1959 the Dalai Lama together a handful of Tibetans crossed the Himalaya by foot and disguised of peasants during almost two weeks. When I left the museum I walked silent by a while, thoughtful, reflecting. Thus, once more I noticed how the British Empire by means of their colonies was in everywhere, because also in Tibet the English were forcing commercial treaties and signing agreements with China, for their interests. I also remembered the oil exploitation agreements that the English made with Iran at beginnings of 20th century. I wonder how the excuse “to liberate the people” can support such a massacre. The same phrase, was used by the Americans and English to occupy Iraq. “They are using the logic of power, not the power of logic” Raifed, the Iraqi refugee who I met in Bahrain had told me. Regarding Serbia and Kosovo, Slobodan had told me: “Our economic system didn’t fit neither with Europe nor with North America and for this reason they encouraged to the separatist groups so that the war explodes. The Kosovo war was not a fair or humanitarian war in defence of the Albanians of Kosovo, but a new concealed colonialism by means of a false diplomacy “missionary” with corporate, military and overbearing interests of the North American foreign policy and its henchmen.